ww2dbaseSon of a school teacher, Albert Kesselring was a WW1 veteran (artillery regiment cadet and later balloon observer). He did not learn to fly until the age of 48 when he was assigned to, secretly, help in the organization of the German Air Force, the Luftwaffe. In 1933, after the Nazi rise to power, he was formally transferred into this new military branch as the Head of Administration. In 1936, he was appointed the Luftwaffe's Chief of Staff after the death of General Walter Wever in an air accident. Shortly before the start of the European War in 1939, a disagreement with Erhard Milch led to his resignation from his present role, and thus he was transferred to the field as the commanding officer of Luftflotte 1 (Air Fleet 1). During the invasion of France in 1940, he was the commanding officer of Luftflotte 2; he would remain at the head of this unit through Battle of Britain and Operation Barbarossa. In Nov 1941, he was transferred to Italy, where he would oversee the evacuation of Axis personnel from Tunisia back to Southern Europe in 1943. As Commander-in-Chief South, he directed the stubborn German defense of Italy. He was injured in an automobile accident in Oct 1944, but returned to command during the final chapter of the war, in Mar 1945, as the supreme commander of the German Army in the West. ww2dbaseOn 6 May 1945, Kesselring surrendered as the Commander-in-Chief of Southern Germany. He was sentenced to death based on war crimes (namely for the massacre of 320 Italian prisoners) on 6 May 1947, though the sentence would later be lightened to a life sentence. He was released in Oct 1952 due to ill health. He published an autobiography, A Soldier to the Last Day, in 1953. He passed away in 1960 in Bad Nauheim, Germany. 20 Nov 1885 Albert Kesselring was born. 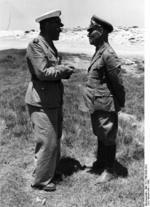 22 Feb 1942 Albert Kesselring arrived at Martuba airfield, Libya. 21 Nov 1943 Feldmarschall Kesselring was appointed commander of all German forces in Italy. 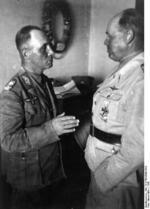 10 Mar 1945 Feldmarschall von Rundstedt was relieved by Feldmarschall Kesselring. 9 May 1945 Feldmarschall Kesselring is captured near Saalfelden, Austria. 14 Jul 1960 Albert Kesselring passed away. Kesselrings transfer to the Luftwaffe ad been against his will, but once there he applied himself to the job. He learnt how to fly (at the advanced age of 48) and would often pilot himself around his command. Smiling Albert Kesselring commanded Air Fleet 2 (Luftflotte 2)during the Battle of Britain. Does anyone know the story of Kesserling's surrender? To whom did he surrender to? He also authorized the execution of 15 OSS commandos captured in American uniforms behind German lines in Italy. Another hapless General who passed along the order was executed after the war but not Smiling Albert! He surrendered to my dad, but since he was a major they had to fly to the rear lines so he could officially surrender to a general. He gave my dad his letter opener, so he would not forget him.